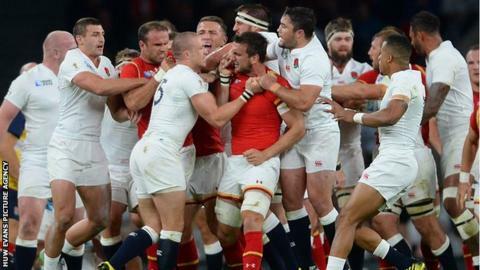 Wales can use their win over England at Twickenham as a springboard to lift the World Cup, says Jeremy Guscott. The former England and British and Irish Lions centre says Wales showed the necessary character, as well as the skills, in Saturday's Group A win to better their semi-final spot in 20011. "Now they've got to go ahead and finish the job," Guscott said. "Four years ago they nearly did it, now they are in prime position to finish off what they started four years ago." Wales suffered World Cup heartache in 2011 after losing their semi-final against France 8-9, after playing most of the game with 14 men following captain Sam Warburton's sending-off for a tip tackle. Warren Gatland's side can consolidate their advantage by beating Fiji in Cardiff on Thursday, a result that would mean England would have to overcome Australia on Saturday to keep alive any hope of being one of the two teams to qualify from the pool. "After that performance and that high and now playing at home, you can imagine the buzz in the whole of Wales," added Guscott, speaking to BBC Wales' Jason Mohammad programme. "When they come into Cardiff they're going to rise and they're going to feel big men and rightly so, and they should be proud of that victory at the weekend. "Wales have a great deal of players who are winners and players of experience, players of stature... these guys have won Grand Slams, Six Nations championships, they've been part of a winning Lions tour. "They've been in tough situations, they've been in tight corners and they live with hard expectation and pressure and come out the other end." However, Wales' victory did come at a cost with their bad run of injuries continuing. Centre Scott Williams, with a leg injury, and full-back Liam Williams, after a blow to the head, were both taken off on a stretcher against England, while wing Hallam Amos also left the field with a suspected dislocated shoulder. Liam Williams will miss the Fiji game with concussion, but Scott Williams and Amos were ruled out of the tournament on Monday and were replaced in the squad by James Hook and Gareth Anscombe. Wales had already been without Leigh Halfpenny, Rhys Webb,Cory Allen and Eli Walker because of injury. "Everybody in Wales was panicking about Halfpenny and Rhys Webb - the best player in Wales last season - but guys have come in and played particularly well," Guscott said. "Scott Williams is a huge loss... but in adversity it seems players find out a lot about yourself and your squad and your management, and every player that has come in for Wales has risen to the challenge. "As long as they continue to do that Wales have a very good chance... they've got as good a chance as anybody [to win the World Cup], why not? "Beat Fiji, get your qualification and then go for it against Australia, put them in their place or come under the shadow that Australia have had over them in the last 10 games."